Jazz band for hire for weddings and other events. Dan Willard is a vocalist and multi-instrumentalist (sax, clarinet, trumpet, and flute) who performs in a wide variety of styles and group sizes. 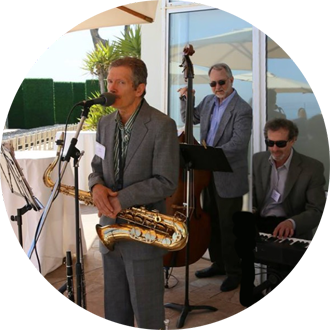 Dan and his group have performed for numerous weddings and events in Santa Barbara, Ventura, Ojai, and surrounding areas. A versatile singer, his repertoire includes tunes sung by Frank Sinatra, Bobby Darin, Tony Bennett, Elvis Presley, Nat King Cole, Roy Orbison, Credence Clearwater Revival, The Beatles, and many more. The band can be as small as a duo or as large as a sextet (Dan plus piano, guitar, bass, drums, and another horn player – trumpet or trombone). Dan and his group are seasoned professionals who will surely to add a touch of elegance to your event! As an instrumental soloist or big band leader, from Dixieland, modern jazz, and rock to classical, Dan has the ability to provide almost any size and style group you can imagine.